Toronto, Canada (June 13, 2017) Today Canadian diabetics have more options with the launch of Nutarniq Essentials Diabetic Neuropathy Supplement. Developed from the successful clinical research of Dr. Evan Lewis, Nutarniq Essentials Diabetic Neuropathy Supplement is the first full spectrum, clinical grade omega-3 supplement targeted for diabetic neuropathy. 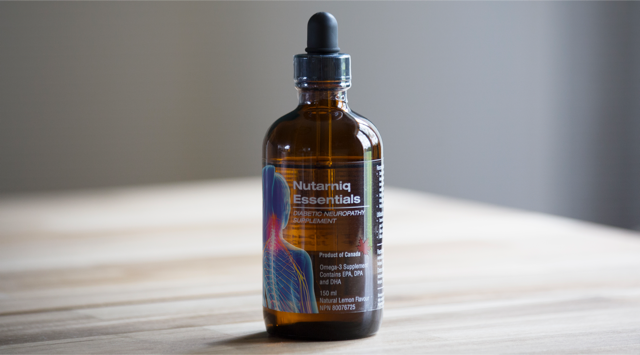 Nutarniq Essentials is a full spectrum pharmaceutical grade omega-3 that contains 200 mg of EPA, DPA and DHA per 1 mL. Users take 5 mL (5 dropperfuls) once or twice per day. Nutarniq Essentials has a unique formulation that enables absorption under the tongue and in the digestive tract. The bottle, with built in dropper, makes it easy to administer the supplement and enables under the tongue absorption. Dr. Lewis founded Nutarniq Corp as a way to take his successful clinical research program outside the lab and help people improve their health. His research has shown that supplementation with full spectrum omega-3s can enhance nerve function in athletes and regenerate nerves in people with diabetic neuropathy. “The launch of Nutarniq Essentials is a major advance for people with diabetic neuropathy” said Dr. Evan Lewis, Nutarniq CEO. “We look forward to supporting the health of diabetics through our continued commitment to clinical research and ongoing product development. Dr. Lewis was lead author on a research paper published this week entitled: The effect of omega-3 supplementation on neuropathy in Type 1 diabetes: a 12-month pilot trial. The paper was published online June 13, 2017 in the prestigious journal Neurology, the medical journal of the American Academy of Neurology. Nutarniq Corp. develops targeted nutritional therapies for chronic disease complications. Nutarniq’s flagship product, Nutarniq Essentials – Diabetic Neuropathy Supplement, is a therapeutic solution for individuals with diabetes and neuropathy. Developed by Nutarniq CEO Dr. Lewis, Nutarniq Essentials is a full spectrum clinical grade omega-3s supplement designed to provide all three essential omega-3s to support nerve structure and function. For information please visit www.nutarniq.com. Dr. Evan Lewis completed his PhD at the University of Toronto, Department of Nutritional Sciences, Faculty of Medicine. While completing his PhD, he investigated the effects of seal oil omega-3 supplementation on neuromuscular function in athletes. The positive results from this research lead to the clinical trial investigating seal oil as a therapy for diabetic neuropathy. “Results from this trial are a very important step towards a clinical therapy for people with diabetic neuropathy” said Dr. Lewis. “With the help of the Health 2 Innovation Accelerator at U of T, I am working to commercialize these results through Nutarniq Corp, a Toronto base biotech startup”. Nutarniq has released a diabetic neuropathy supplement in an effort to take these impressive findings outside the lab and provide support for the 11 million Canadians with diabetes and pre-diabetes.